I’m about 3 1/2 months into eating pegan (paleo + vegan) style. Read more about what “pegan” is and what I’ve been eating here. That means I’ve been without cheese, gluten, and most processed foods for almost 4 months. I started out on this journey because I was diagnosed with estrogen dominance and decided to do whatever I could to naturally combat insulin spikes and adrenal fatigue through diet and lifestyle so I could forego medication. I started off on a strict version of the diet- more on the paleo side of things- to really reel in any blood sugar issues, but have now moved closer to the true “pegan” spirit by allowing quinoa, black rice, and other gluten-free/dairy-free foods into my diet in small quantities. I know it sounds restrictive, and as a fan of “everything in moderation,” it felt that way to me at first. But now? There is not much I miss. I’ve been feeling so good without dairy and grains that I don’t think of them often, beyond the convenience factor. And my body seems to be more metabolically efficient now that I can indulge every so often without noticeable consequences. (Well, except for beans; I just need to accept that if I eat beans I will feel bloated). I do not advocate this way of eating for everyone, because if I know anything for certain, it’s that health is personal and what works for one person may not work for the next. However, I can vouch that eating a ton of plants, nuts, seeds, avocados, and lean, high-quality protein is making me feel pretty great. 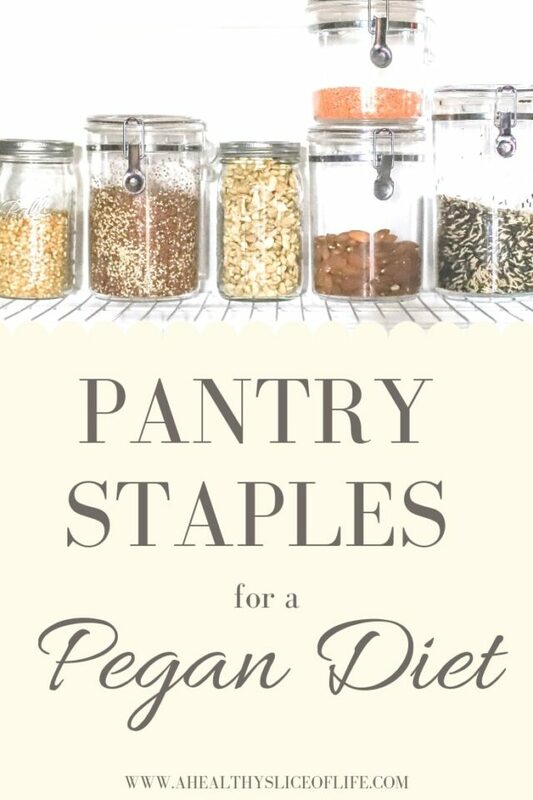 Today I wanted to share my pegan diet pantry staples with you because it’s taken me a lot of trial and error to end up with a stock of items that fit my dietary needs and allows me to quickly throw together a delicious meal. I buy most of my items through Thrive Market (affiliate link), which I use like a virtual grocery list, adding things I need through the app until they add up for free shipping and a free gift, then order at that time. I order my meat through Butcher Box (affiliate link) so I can guarantee the quality I’m after. FYI: Butcher Box is having a special that if you sign up now, your get 2 Lb of grass-fed ground beef for free for life! *I also buy organic whenever possible, so most of these items are organic because it guarantees no GMO’s, which is really important for some items, like the tamari. Tamari: a great gluten-free soy sauce alternative made of fermented soy beans. Works well if sauces, dips, stir-fries, and dressings. Coconut Aminos: a soy-free soy sauce alternative, with a lighter flavor than tamari. Works well if sauces, dips, stir-fries, and dressings. Olive Oil: For low-heat cooking, dressings, marinades, and drizzling. Avocado Oil: For higher heat cooking and roasting. Grass-Fed Ghee: Ghee is a byproduct of butter, made by slowly simmering butter then straining off the milk solids. You are left with ghee, which is pure butter fat. It has reduced lactose. It has a really high smoke-point and is my go-to for sauteing. Unfiltered Apple Cider Vinegar: I love it for marinades, dressings, and for general health maintenance or when we are sick. Primal Kitchen Dressings: I always have their ranch on hand, and usually their Greek and lemon Turmeric dressing as well. Turmeric: A bright yellow aromatic powder with powerful anti-inflammatory properties obtained from a plant of the ginger family. I sprinkle it in meals whenever I can, especially curries and Asian dishes, but also as a substitute for fresh turmeric in my favorite tonic. Cumin: My favorite spice. I use it in Mexican and Asian dishes mostly. It’s the aromatic seeds of a plant of the parsley family, usually ground. Garlic Granules: Granules are dehydrated finely minced garlic that tend to have a stronger taste than garlic powder. I sprinkle these on veggies before roasting. Spice Blends: I like to keep a taco spice blend, Italian blend, and Greek blend on hand for easing seasoning. Tea: I’m a tea junkie. I always have green tea and matcha on hand, but in the mornings I always drink Earl Gray, then usually have a cup of Ginger Turmeric tea in the afternoon, and a cup of Dandelion Root tea in the evening. Almond Flour: Used in paleo baking. Coconut Flour: Used in paleo baking. Arrowroot Powder: a white, flavorless powder used to thicken sauces and soups, but also used in a lot of gluten-free baking and cooking, especially in one of my go-to grain-free cookbooks: Eat What You Love (affiliate link) by Danielle Walker. Dates: For sweetening smoothies, dressings, baked goods, etc. Cashews: Makes delicious, creamy, dairy-free sauces, thickens soups, delicious on their own. Chia Seeds: Sometimes I use these for chia puddings for breakfast, but I add them to smoothies and always keep them in a shaker for the girls to sprinkle on top of yogurt, peanut butter banana toast, etc. Ground Flaxseed: For adding to smoothies and paleo baked goods. Almond Butter: For smoothies, for toast, for eating off a spoon. Brazil Nuts: Rich in selenium, I eat one a day to help with hormones and keep a strong immune system. *The pegan diet recommends limiting grains to less than 1/2 cup per meal, but if you have blood sugar issues, you should further limit them. Organic Canned Chicken: I keep this on hand to add a quick protein to lunch wraps. Wild Caught Canned Salmon: Use this to make these salmon burgers (sub panko). So good! Coconut Milk: a delicious base to a plethora of yummy sauces, and can also be blended into coffee or smoothies. Palmini: I am in love with Palmini. It’s 100% hearts of palm, cut into linguine “noodles.” No fillers or weird ingredients, just hearts of palm. It has a great texture and it’s so easy to just drain and heat. If you have any questions about the pegan diet, or what I’m currently working on for my own personal health, just leave it in the comments and I’ll be sure to respond to the best of my ability! Just curious…what type of doctor diagnosed you with estrogen dominance? Did you have to see an ND to get the diagnosis? I’d like to be tested, so just wondering!! Thanks. I went to my regular OBGYN to start investigating and all the symptoms pointed to estrogen dominance. I then had a consultation with Ali Damron and she confirmed estrogen dominance. Just like PCOS, it’s not a single test you take and have a positive/negative result; it’s a list of symptoms for the most part. However, I am looking to a functional medicine doctor so I can dig more into it. Semi confused, if you are vegan than you wouldn’t eat lean protein??? but pegan allows lean protein. I am a vegetarian used to be vegan however when I was living abroad back in the 90s I had a hard time getting enough calories so I started eating cheese (I was living in France) and now I cannot imagine not eating it. Anyway so it’s really not vegan at all. This is generally how I eat on a regular basis. I would love to see some of the meals you make on a regular basis. I always feel like I get stuck in a rut making the same things over and over again. I’m curious if David is following a similar diet? I remember you saying he felt really good not eating meat and wondering if that has changed. Thanks for the good pantry recommendations. I have some blood sugar issues and think this sort of diet would be helpful for me (though for some reason I hate the term/theory of “Paleo”). You forgot Palmini on your list! I am in love with that product–thanks for introducing me to it. I also really like OuterAisle brand of Cauliflower thins and pizza crust. I’ve ordered them on Amazon, and our Wegman’s just started carrying them. I take them with me to restaurants if I know I want a burger or other sandwich. Well, I only take them to the place where we’re regulars and they accommodate all of my dietary needs. How does this differ from Paleo? Pegan allows moderate grains and legumes/lentils, where as paleo does not. Also, pegan suggests using meat as a condiment (just small amounts of high quality meats) where paleo has it more as a main entree many times.